Placed washed & quartered potatoes in a medium pot, bring them to a boil and cook for 12-14 min until tender. In a small pot bring to a boil 1 1/3 cup of milk with 2 smashed garlic cloves. Remove from heat and let the mixture stand. 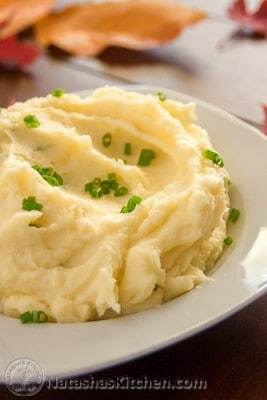 Drain and mash cooked potatoes using potato masher and hand mixer afterwards. Place potatoes back on the stove at medium heat, stirring constantly for 2 minutes until slightly dry, than remove from heat. Add to potatoes and mix together 1 1/3 cup of milk mixture (-garlic cloves), 3 Tbsp of butter, 1/4 cup of sour cream, 1 tsp of salt, 1/8 tsp pepper, 1 Tbsp of chives until well combined. Serve warm and sprinkle chives on top for garnish.